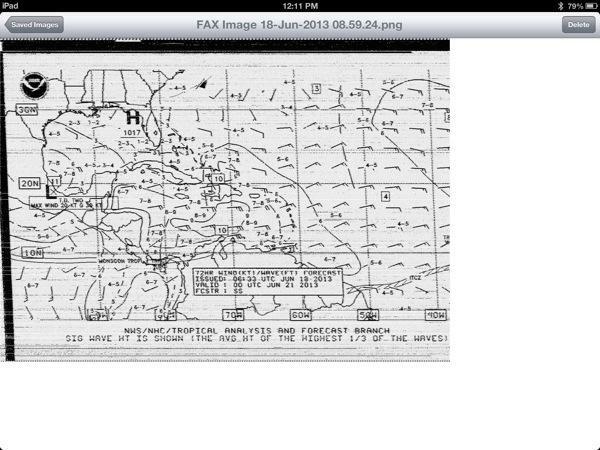 One of the many uses for our iPad has been to download GRIB ( wind data) files and plan our upcoming passages. As important as Tetris and Angry Birds are to our watchkeeping our iPad was also used to gather weather information while we were underway. The National Weather Service dramatically cut weather fax transmissions in 2007, but thankfully the high seas forecasts that we need were spared from these cuts. Twice a day a weather map showing predicted winds for the next 24, 48 and 72 hours is sent out over high-frequency radio waves. Rode Trip carries a “world band receiver” that we can use to pick up this signal. When the receiver is tuned correctly it makes a horrible beeping noise, exactly what you would hear if a fax machine has ever dialed your home phone number by mistake. The world band receiver that we elected to buy is a Sony ICF-SW7600GR. It is loaded up with tons of features that we never ever use, but does a great job of tuning in to the stations that we care about. We also carry a spare receiver that was given to us by our friend John out of Newburyport, MA. 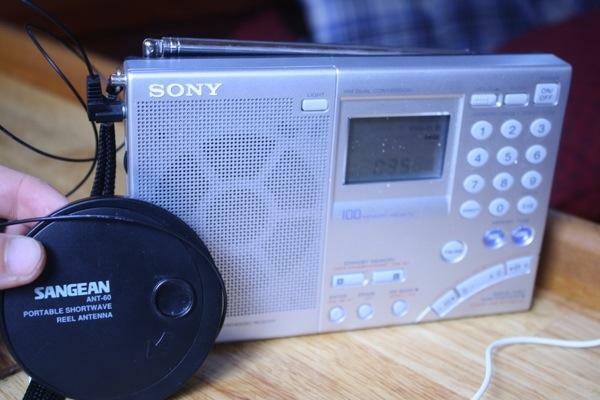 The Sangean reciever that he gave us had a better antennae so it has been put into use with our Sony. We use a set of ear-buds to direct the sound as close the microphone on the iPad as we can. 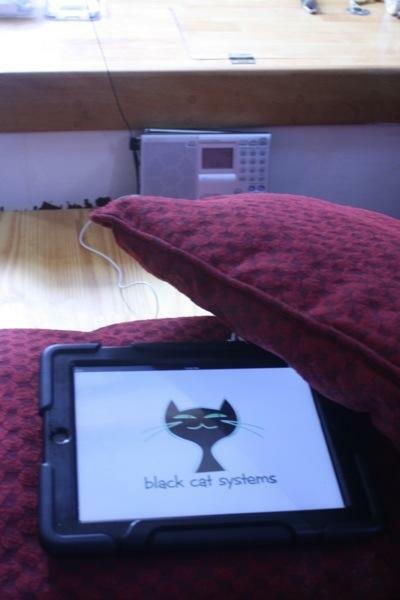 If the boat is really rocking and rolling we use a high tech sound dampening system consisting of two pillows, one under the ipad and one on top to block out interfering noises. 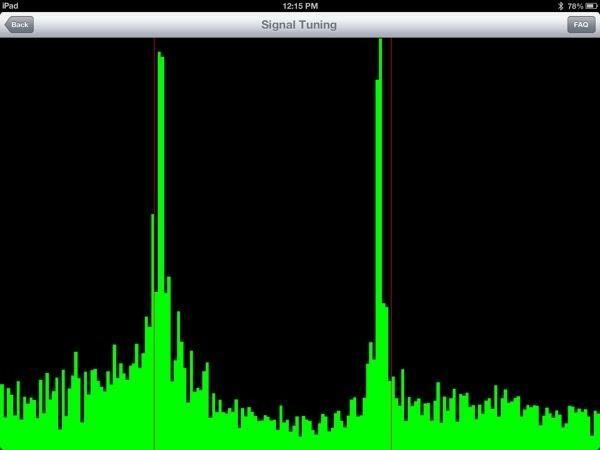 The iPad uses an app called “HF Fax” to decipher the incoming signal and make it useful to us. We were planning on buying a stereo-in plug for the iPad, but we haven’t gotten around to it yet and the earbud/pillow technique has worked pretty well so far. The signal is tuned on the reciever until the two “peaks” are as close to the red lines as possible. The red line on the left indicates a tone that represents a black dot, and the red line on the right indicates a tone that represents a white dot. After the receiver is tuned we just have to wait for the transmission to finish. Each image takes about 10 minutes at which point we need to manually push the save button to keep the image. The app is supposed to save the files automatically but that doesn’t seem to work right now. It takes about an hour to download the basic weather forecast that we are interested in, namely the wind/wave forecast. On a good day the files will come out looking like this. In this case we decipher as best we can and hope that there is only one tale on that wind arrow… If you need a little more information about how to read this weather fax you can read our old post on Weather Windows. If you are reading this post to try and learn how to download your own weather faxes, here are a few tips that I’ve learned while figuring out our system. 1. The sound cards on most laptops are not good enough to decipher weather faxes, but if yours is then a good program to download is JVcomm32. It has a good set of instructions to get you started. 3. Make sure that you start tuning your receiver before the fax actually starts or the image will come in with a break in the middle, making it harder to use. 4. The frequency which you can receive the best image from changes from day to day. I imagine that a real HAM guru could predict which signal would work the best, but I try each of them in turn and see which gives me the best image. 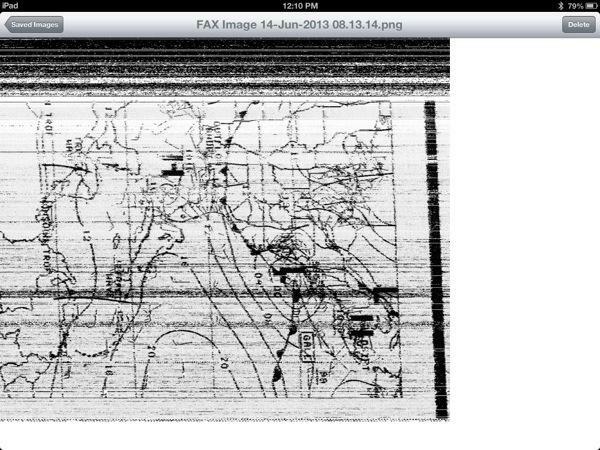 I usually do this on the weather fax image scheduled just before the first image I actually care about. Wow – what an interesting combination of technologies! I would think a stereo mini-plug wire between the two would improve your results, but it’s hard to beat the practicality of the pillows. I’ve been learning about the GRIB data and I’m going to see if I can figure out how to overlay that data on the Atlantic Crossing map.